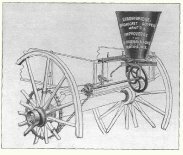 Introduced in the 1850s, to replace hand seed spreading, it is mounted off the back of a wagon. As the wagon is rolled over the soil, a small "fan" at the bottom flings the seeds over the field. A harrow then buries the seeds. This is a fast way of seeding, but the seeds sometimes are covered by too much -- or too little -- soil. 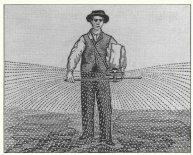 By the 1880s, it was often replaced by a grain drill. Prior to 1850, grass seed and some larger grains, chiefly oats, would be sown by hand by being thrown out of the sack. After 1850 "knapsack" seeders, as shown to the left, were introduced. Soon wagon mounted broadcast seeders were available. The picture below shows how the power was taken from the rear axel of the wagon. After the seeds were broadcast, a harrow would be run over the seeds to stir the dirt around them. Broadcast seeds are not always covered by a uniform or sufficient depth of soil. 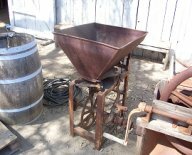 By the 1880s this was replaced by the grain drill as it could plant the seeds at a consistent depth. Pictured right is a Wagon-mounted broadcast seeder. In the top bin an agitator keeps the seeds constantly moving to prevent clogging. The seeds drop onto the impellers which fling the seeds out onto the field. The handles in the back control the openings which adjusts the rate the seeds drop on the impeller. The right handle could close the seed openings rapidly to start and stop the seed flow. A missing left handle engaged the sprocket which powered the seed spreader.